What the hell just happened? A few short years ago, when I first started getting into this cocktail thing, rye whiskey was like the secret handshake of the liquorati — if you knew about it, and mixed your drinks with it, and dropped that into conversation with a fellow traveller, it was the equivalent of a high-sign between Skull and Bones brothers. It helped that the stuff was so rare. Sure, Old Overholt could be found pretty easily, along with bottles of Jim Beam Rye, with their garish yellow labels. A little casual digging could turn up some Wild Turkey Rye, and if you were lucky, you might even see a bottle of Van Winkle Family Reserve from time to time. But, at least here in Seattle (which, for all I gripe, is a lot better off, selection-wise, than many other places), that…was…it. Now, rye is everywhere. Well, not completely, but a definite wave is taking place. Heaven Hill’s sleepy old Rittenhouse came out of nowhere a couple years back to take top honors at the San Francisco spirits competition, and since then the bonded version has deservedly attained rock-star status among booze geeks from coast to coast. Michter’s, too, is becoming easier to find, and last year Buffalo Trace altered the rye landscape by not only continuing the sporadic yet highly anticipated production of their 18-year-old Sazerac Rye, but by rolling out the 6-year-old “baby” Sazerac and sending it to markets all over the country. Independent labels like Black Maple Hill and Classic Cask have released scarce yet whammo-quality ryes in recent years, and down in San Francisco, Fritz Maytag keeps producing his small-batch, minimally aged whiskies using his mad-scientist, single-malt rye, toasted-oak process. 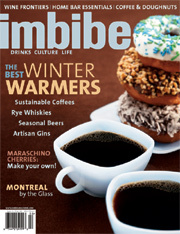 This month, another rye feature story appears in Imbibe magazine, written by — well, that’s the second piece of self-promotion in this post. In Asimov’s rye post, he indicates how much fun he had doing the research for the piece, and that’s a sentiment I have to echo about my article in Imbibe. While working on the story I had the great pleasure to talk to brand managers, distillers and bartenders including Larry Kass at Heaven Hill (makers of Rittenhouse, Pikesville Supreme and Stephen Foster ryes, along with a slew of other spirits), Preston Van Winkle from the great Van Winkle bourbon dynasty, Mike Miller at Delilah’s in Chicago, Jackson Cannon at Eastern Standard in Boston, and the inimitable Fritz Maytag from Anchor Distilling. I also had the opportunity to taste a lot of rye, and this is where timing was key. Given the attention rye is getting, and the number of brands and bottlings now starting to appear in the US market, I had many more choices of whiskies than existed even a year ago (and even then, I didn’t get all the brands that are either currently available or coming out soon). A one-page overview of my tasting notes are included with the story in Imbibe, but I wanted to spend a little bit more time exploring these different whiskies, so over the next couple of weeks I plan to run short descriptions of each the whiskies tasted. The particulars: In late September a tasting panel gathered at my home to sample 18 different American rye whiskies for this article. The tasting panel was comprised of myself; Robert Hess; and Murray Stenson and Kacy Fitch, bartender and co-owner, respectively, of Zig Zag Cafe. (The tasting actually took place in two phases: the first phase at my home, we sampled 14 ryes; later that week, four additional ryes, which hadn’t arrived in time for the panel, were sampled by Murray, Kacy and myself. Sorry, Robert). Over the course of three hours, we explored the characteristics of ryes ranging in age from four to 21 years and in price from $12 to $150. The tasting was done blind (pouring was handled by my wife, Leonora), so none of us could be biased by a sample’s label, price or reputation. In addition to discussing the whiskies, we also talked about rye’s role in cocktails, the use of super-premium spirits in cocktails and several other topics; the session was taped, and I plan to delve into these topics as I explore these whiskies in the next couple of weeks. Once I’ve covered these, I’d like to supplement my rye notes with tastings of two additional ryes that I’ve come across after the article went to press: the brand-new Templeton Rye, and Old Potrero’s Hotalings Rye Whiskey. Pull up a glass — let’s talk rye. I am unbelievably jealous. A comitted rye dork, I was only very recently able to get my hands on the Sazerac 6, making it only the 4th different bottling I have been able to sample. I envy you and await your findings. There’s alot of legwork involved, but I’ve ammased a collection of 13 ryes at our bar in Philly. (Don’t ask how hard it was to get a that many in Pennsylvania) Some of which I’ve got the last in the country of. Glad to see all us rye dorks creating an intrest and having the products become more avalable. Been trying real hard to get the Old Potero here in PA, but it’s a drag dealing with the PLCB. Stop by Southwark if your in Philly! I’ve been drinking rye whiskey for a bit more than 20 years, and like you I wonder, what the hell just happened? Not very long ago it was extraordinarily hard just to find the stuff (or run into a bartender who knew what it was) and now there’s a dozen or more brands out there for the tasting. We may have lost our secret handshake, but we’ve certainly gained some really great whiskies! Thanks for a great series. Your readers may want to know that just about all of the ryes that you sampled, and a few others, are available at the Alembic Bar, on Haight Street in San Francisco. With about 18 different ryes available, they claim to have the best selection west of the Mississippi. Something else to check out, and available without leaving your seat, is a video on youtube of Fritz Maytag talking about the making of Old Potrero, full of fascinating whiskey history and lore. Search under “rye whiskey” to find it. Cheers! Well. What a wonderful and timely discussion. Yes, rye has been neglected for far, far too long. In fact, it’s only been in the last few years since that most worthy whiskey, bourbon has received it’s due – so rye surely should be close behind. Here at Liberty, we have a tight but wonderful collection of rye, which we happily offer tastes to for those that are inquiring. and a number of other bottles. Of these, only the Old Potrero do I find lacking. The Handy? Outstanding. Just outstanding. The Michter’s 10? Easily the most unique of the lot. Very enjoyable. And, our newest addition, the Templeton, at only 80 proof is a wonderful addition to anyone’s liquor shelf. Yes, the biggest problem is finding these bottles, but…..with eBay and certain liquor stores more than happy to ship these bottles when they have them available…they are within your grasp – but at a dear price in most cases. Thanks for the review, Paul. This has been an enjoyable read. I was wondering if you ever got around to reviewing the Old Potrero’s Hotalings Rye Whiskey. I’m very interested in how it turned out. Thank you for this great article, due to it I searched and scoured and found a bottle of the Black Maple Hill 23yr. You were right, it is simply amazing! Unfortunately here in Michigan, the state liquor-controlled arrangement seems to allow only 4 Rye Whiskeys to be sold. One of which is Russell’s Reserve Rye, made by Austin Nichols Distillery, Lawrenceburg, KY (which, I believe, also produces Wild Turkey). It is six-year-old, small-batch, 90-proof Rye. As I posted earlier, I find this to be a wonderful and smooth Rye Whiskey. It has a full-bodied and spicy character, and its complexity lingers on the tongue. It is not to be missed.